The Innovative Triple-Wall Chimney System from Simpson Dura-Vent, Offering Superior air-insulated Performance and Ease of Installation. If Triple Wall Chimney is what you are looking for, then like the DuraTech is to solidpack, this is the best Triple Wall Chimney on the market. Note: Triple-Wall Chimney is mainly used now for Pre-Fab fireplaces that require air-venting. For all other applications, we suggest DuraTech solidpack chimney. 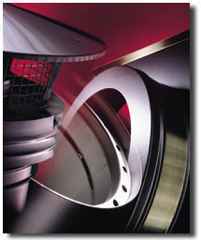 Dura Plus is the leader in triple-wall chimney for wood, oil, gas, and coal-fired appliances. DuraPlus Chimney features a patented firesafe design. A Dura/Plus chimney stays cool on the outside at all times, to protect the building during normal stove operation. It stays hot on the inside to discourage the deposit of creosote, while providing the correct draft for stove performance. If a red hot creosote fire does erupt, the patented Dura/Plus FIRESAFE DESIGN serves to protect both the chimney and the building. Dura/Plus chimney pipe in 6 inch, 9 inch, and 12 inch lengths have a 1 inch insulating blanket. The 24 inch and 36 inch lengths have a 1/2 inch blanket. Check out the Typical Chimney Installation Diagrams ! Before you order: Download Dura/Plus Installation Instructions (643 kb PDF) and familiarize yourself installing a Dura/Plus Chimney. Make all measurements twice and make your plan. Write down all parts, part numbers, and quantity needed to build your chimney. Chimney parts are NOT returnable, so please make sure you plan your chimney well. Call us if you are unsure of what you need, we are always happy to help you figure out what you need, but before you call, please read over our Support Policies. Product Note: All "Special Order" items have a 2 week lead time and are not covered by our 5 day delivery guarantee. 9" Chimney Length; Dura/Plus 8"
12" Chimney Length; Dura/Plus 8"
24" Gal Chimney Length; Dura/Plus 8"
24" SS Chimney Length; Dura/Plus 8"
36" Gal Chimney Length; Dura/Plus 8"
36" SS Chimney Length; Dura/Plus 8"
15 degree ElbowKit; Dura/Plus 8"
30 degree Elbow Kit; Dura/Plus 8"
Stainless Tee with Cap; Dura/Plus 8"
Galvanized Tee with cap; Dura/Plus 8"
Stainless Tee Support; Dura/Plus 8"
Galvanized Tee Support; Dura/Plus 8"
Stainless Wall Thimble; Dura/Plus 8"
Galvan. Wall Thimble; Dura/Plus 8"
Stainless Wall Strap, Dura/Plus 8"
Galvanized Wall Strap, Dura/Plus 8"
Round Ceiling Support; Dura/Plus 8"
Square Support Box; 24" long; Dura/Plus 8"
0/12-6/12 Roof Flashing, Dura/Plus 8"
7/12-12/12 Roof Flashing, Dura/Plus 8"
Must be shipped by Freight Truck!